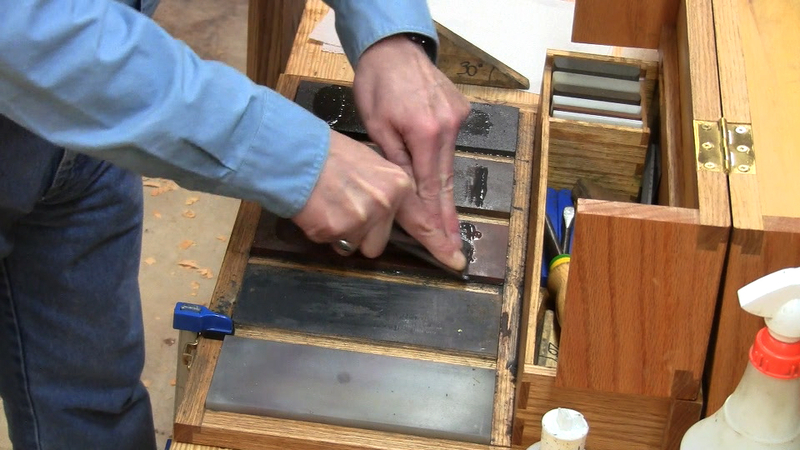 Freehand sharpening on oilstones: just one of 5 different sharpening methods covered. Sharpening is just one of 7 parts of the course. 59 videos. Over 12 hours of content (see episode guide below). 5 months of effort from the first email discussion. Hours and hours in the workshop weekends and nights, and more hours on the train editing video and writing accompanying text. A lot of understanding and support from my wife. My Intro To Hand Tools course is available at Popular Woodworking University for online viewing, or you can purchase individual parts as digital downloads at Popular Woodworking's online store. Both formats are completely self-paced, so you can watch the videos at your convenience. If you're new to hand tool woodworking, or just want to add some skills, this course is for you. The cost is only $59.99 for the online course, just over a dollar per video, or $4.99 for each of the six downloads, even more economical. You can read reviews of the first online session here. It's divided into 7 parts. I cover multiple methods so you can pick the one that you like or that best matches the tools you have available. Try as many methods as you can to build your versatility. That will give you the background to incorporate other methods that you learn about. "Fistfights And Fundamentals" videos highlight the different methods and compare them. "Exercise" videos provide practice exercises to develop hand and tool control. While I show everything using easy-to-work eastern white pine, all the skills apply to harder woods. Do the exercises first in easy wood to get the skills, then repeat them with more difficult woods. This is like learning to play a musical instrument: start with easy material, then advance to harder material as you make progress. Each step forward is a new learning experience. Don't be afraid to make mistakes. As long as you don't hurt yourself or damage anything, mistakes are also great learning experiences. Get your mistakes out of the way on practice exercises so you don't make them on real projects. Everything you make in the exercises makes excellent firewood! Meanwhile, you've acquired skills. And just like learning to play a musical instrument, you probably don't want anyone to hear your early practicing, full of mistakes. But with persistence, you start to get it. If you haven't seen them, check out the sample free course video and my silent trade show trailer that I'll have running when I do live demos. The first is an example of an individual video, and the second shows snippets from all the videos. A tool list is here. Fistfights and fundamentals of the different methods of doing things. Like learning to play a musical instrument, practice! Workbenches: Roubo, Sellers, Underhill portable, apartment folding. Other tools: router, rabbet, and shoulder planes, spokeshave, drills, scrapers. Plane sizes, functions, and order of use. Fistfights: bevel shape, abrasives, sharpening motions and techniques. Flat, convex, and concave bevel shapes. Oilstones, sandpaper, waterstones, diamond stones, and strops. Sharpening motions, freehand and jig. How to evaluate an edge. Freehand sharpening a plane iron with a convex bevel on oilstones. Easing the corners of the iron. Freehand side-to-side sharpening a plane iron with a double bevel on sandpaper on glass. Freehand sharpening a plane iron with a double bevel on waterstones. Jig sharpening a plane iron with a double bevel on waterstones. Freehand honing the chisel on a diamond plate. Jointing and setting saw teeth. Sharpening a crosscut saw, simple fleam guide. How a card scraper works. Pin, knife, wheel marking gauges. Marking edge, end, and cross grain. Checking and using a square. Sawing on a sawbench and the workbench. Crosscutting, ripping, and resawing practice. Fistfights: bevel orientation, number of planes, body style. Bench plane functions and shavings comparison. Planing order of operations and iron profile. First face: roughing, flattening, smoothing. Alternate workholding methods for face planing. Second edge: roughing, jointing to precise width. Second face: roughing, flattening to precise thickness. Second end: rough trimming, shooting to precise length. Alternate workholding methods for edge planing. Roughing, flattening, and smoothing with wooden bench planes. More alternate workholding methods for face planing. Face, edge, and end grain planing practice. Tapering legs with bench planes. Alternate workholding methods for tapered pieces. Making a pillow-style raised panel with bench planes. First method: making a raised-field style panel with chisel and bench planes. Second method: rabbet and shoulder planes. Third method: skew block planes. Edge vs. end grain gluing, cross-grain joints. Chopping, paring, and controlled splitting. Wedging action of the bevel. Edge jointing for perfectly flat joint. Destructive strength test: how much weight can it hold? Ganged planing of complementary angles. Grain orientation in large panels. Using a luthier's style large shooting board. Forming up a half-round panel with a bench plane. Metal and wooden match planes. Tongue and grooves with 3 different types of match planes. First method: making edge and end rabbets with a chisel. Third method: wooden skew rabbet plane (moulding plane). Sixth method: skew block plane. Seventh method: moving fillister plane. First method: making grooves with chisel and router plane. Second method: saw and chisel. Fourth method: wooden plow plane. Making dados with saw, chisel, and router plane. Alternate cleanup with a shoulder plane. Side rabbet plane for widening dados. Making face lap joints with saw, chisel, and router plane. Making edge lap joints (notched joints). Glue up and trimming flush. Using a shoulder plane or chisel instead of router. Fistfights: chop vs. drill, fitting straight off the saw. Quiet woodworking to avoid disturbing the family or neighbors. First mortise method: chopping with a chisel. First tenon method: sawing for fit right off the saw. Trimming and adjusting fit if necessary. Second mortise method: drilling and paring. Second tenon method: sawing fat and paring. Sawing to the line practice. Paring to the line practice. Making the joint with saws and chisel. Fistfights: pins vs. tails first; sawing vs. chopping waste; angles. Strength test of a dry fit dovetail: how much weight can it hold? First method: tails first, sawing out the waste with a coping saw. Making the tail board with backsaws, coping saw, and chisels. Continuing the tails-first method: pin layout from the tails. Making the tail board with backsaws, coping saw, and chisel. Second method: pins first, chopping out the waste with a bench chisel. Making the pin board with backsaws and chisels. Continuing the pins-first method: tail layout from the pins. Making the tail board with backsaws and chisels. Pin layout from the tails. Making the joint with backsaw, chisel, and router plane. Making a tapered sliding dovetail with the same method. Using eggbeater and push drills. Roughing curves with chisels, straight saws, and gouges. Roughing curves with bowsaws and coping saws. Refining curves with wooden and metal spokeshaves. Refining curves rasps, scrapers, chisels, and gouges.